Every producer wants peak crushing performance but not every producer knows how to achieve it. Getting there may require just a few tweaks or a total rebuild, while remaining at peak levels requires proactive maintenance practices, combined with expert consultation and continuing education, according to Mike Schultz. As crushing product manager for Superior Industries, Schultz brings more than two decades of crushing industry experience to their team of product, parts and service professionals. "Maximum cone crushing performance requires a complete understanding of the application parameters, the design limitations of the crushing machine and the processing circuitry needed to support that machine," he emphasizes. A cone crusher uses compression to effectively crush abrasive material, as well as a wide variety of stone from medium to very hard compressive strength. It is a versatile machine that can be used in all phases of material reduction, from the rock face to product finishing but more often than not its duties are targeted to secondary, tertiary and quaternary aggregate and mining applications. Schultz explains that from a bottom-line standpoint, to maximize performance and cut wear costs means you need to get every stone through a cone crusher that you safely can, while preventing any machine damage, and still meet or exceed production goals. Whether specifying a new machine or fine-tuning an existing crushing circuit, all key parameters must be defined upfront, Schultz says, and that means defining the work that you want that crusher to do. To do this, operations must provide data on proper feed gradation, desired output gradation, tonnage requirements and, most importantly, the material type. In addition, knowing the precise composition, compressive strength (maximum force that material can withstand before breaking) and chemical properties of the stone is a huge factor in determining how much work a cone crusher needs to do. "Many operations try to do too much with one machine, pushing it beyond its design limitations, causing excessive component stress and wear and the potential of serious damage," Schultz says. All crushers are designed for certain reduction ratio limitations. In most cases, cone crushers provide reduction ratios (the ratio of the feed size to the crusher vs. the size of the crusher discharge) of 4-to-1 up to 6-to-1. 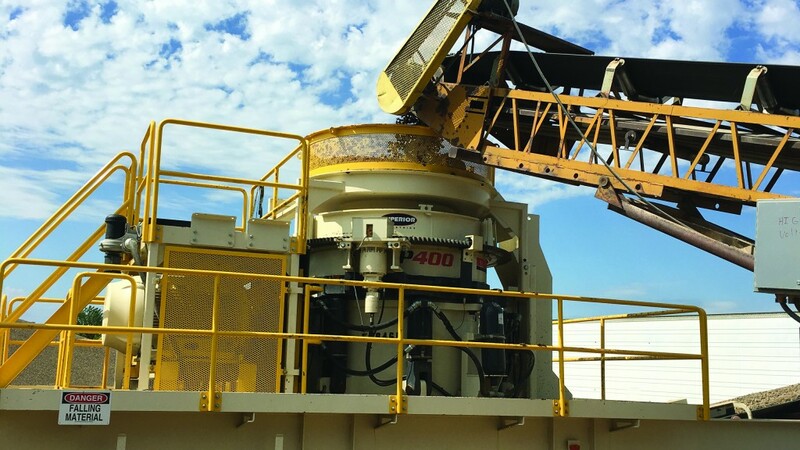 "The reduction ratio design limitations and the rated capacity (tons per hour) of the cone crusher are the most important factors to consider when designing a crushing circuit – and determining how much that crusher can safely do," Schultz says. Once complete application data is in hand, it's important for operations to work closely with their crusher supplier to select the right crusher. Key considerations will be crushing speed, chamber design, liner configurations and crusher settings. "Whether it's minimizing fines or maximizing fines, or trying to create the highest yield of a particular product, there are chamber and liner configurations designed specifically to meet the desired product yield," says Schultz. For performance efficiencies, proper circuitry should be designed around the cone, says Schultz. Importantly, the circuit should be engineered to provide the cone with choke-fed material, or enough material to keep the crusher full. Having too little feed can cause the machine to side load, which stresses components. Also, having too many fines in the feed leads to premature wear issues. Having adequate screening capacity downstream of the crushing circuit is another key factor. In a closed-circuit setup, material that is not properly sized is recirculated back to the crusher for further reduction. "It's very common to see operations that have a bottleneck at the screening circuit. They do not have enough screening capacity, so properly crushed material is sent back to the cone. These unnecessary recirculating loads simply eat up more space and horsepower in the crusher while increasing wear," says Schultz. "To significantly affect cone performance, automation doesn't need to be over-the-top and super complicated, but rather quite simple and very easy to control," Schultz emphasizes. One of the biggest things that automation delivers is protecting the machine from damage by acting as a warning system that alerts operators to conditions such as bowl float, excessive amperage or temperatures, and lubrication or low-flow oil issues. As an example, he points out that Superior's Patriot Cone series features a three-sensor "bowl float" or "ring bounce" monitoring system that alerts the operator if conditions are overexceeding the design limitations of the cone. The top and the bottom of the cone are held together by hydraulic cylinders. When the crushing action on the cone exceeds the pressure that is holding those two pieces together, it causes bowl float or ring bounce, which is any movement at all (even slight) between the top and the bottom of the crusher, Schultz explains. Undetected bowl float will eventually lead to component failures. "When operating a cone, preventing bowl float is arguably the single most important thing you should ensure." Most cone crushers are designed to open up due to tramp metal or an uncrushable situation. However, no cone crushers are designed to operate under normal conditions with ring bounce. "There should be zero ring bounce or bowl float under normal operating conditions," says Schultz. "Without an automation package, it can be difficult to detect ring bounce at times. You can literally be standing on the machine, and you cannot detect even the slightest ring bounce – so having that automated warning system is an enormous advantage." One of the major misconceptions Schultz encounters in the field is the way operators view the closed-side setting (the material discharge opening from maximum to minimum) of the cone. He says that operators often try to maintain a specified closed-side setting, assuming that will yield the desired product output no matter what. Often, they close the setting down to the smallest point possible and then let the machine beat itself up. Schultz suggests a better approach to setting up a cone for maximum performance. First, consider the true limiting factors of any cone crusher are attached power and crushing force. After determining the proper speed and liner configuration, it is possible to dial in the proper settings of the machine based on maximizing the amp draw to a desired set-point, while making sure that the machine does not incur ring bounce at that point. He also encourages operations to tie an automated warning system into the designed amperage utilization of the machine. With Superior's automation package, "if the motor and the machine are being overworked, the system will either take steps to reduce the amp draw, or will send an alarm to the operator," he explains. Automation features are designed to maximize the life of wear components. Patriot Cone's auto-wear compensation, included in the automation package, is an example. As liners begin to wear, the crusher is designed to automatically compensate for that wear in order to maintain the same settings in the machine. With liner wear, the space between the two compression components expands. At the same time, the auto wear compensation system automatically closes the machine down to maintain proper settings throughout the life of the wear components.